After riding Rocky Neck, my daughter and I rode Giants Neck, where we are spending the week on the beach. In fact, the house we rented is about 20 yards from the beach and has an excellent view of the water. Giants Neck looks like many summer vacation cottages that are slowly transforming into make overs for summer rentals. The house that we are renting is now rented all year. Our rental located across the street from one of three private beaches, which is only 20 yards away and basically the house overlooks the water. Nearby is Rocky Neck State Park, where I have already been mountain biking, which has a really big beach and camping area. This was Katie's longest ride on her bike, 4.5 miles. Granted, it didn't have any trails but it was beautiful none-the-less. There are some really nice looking homes on Giant's Neck. There is something really intriguing behind the house we are renting. It's a road cut through the ridge that makes up the peninsula that makes up Giants Neck. It makes absolutely no sense. There are no houses on this section of the road which led me to believe that it must have been part of a trolley line or perhaps a spur line that would bring passengers to Rocky Neck State Park. It just looks too much like a railroad went through here! In 1852, a single track was cut through the property for the new railroad. This was widened and realigned in 1889, and the stone excavated from the ledge to accommodate the new tracks was used to build a pier for the quarry operation. The Railroad cut through Giant's Neck looks like it could only accommodate one track but then again trains back then, while still using standard gauge were a lot smaller back then then they are today or even in the 1930s. I say this because if you look at the maps below, the top map is from the 1893 Groton topo, UNH LIBRARY, Government Information Dept. 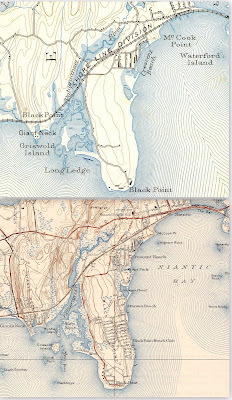 Historic USGS Maps of New England & NY, compared to the 1938 topo clearly shows the tracks moving further north. This is fascinating. I lived in Giants Neck a couple of different times. The first time was in the late 70's and then again in the mid 1980's. I was in middle school. I remember that road with the bridge and it never occurred to me that was an old railroad grade. It makes sense now. That pond on down there we used to skate on in the winter. Strange but true. I'm sure it doesn't freeze any more. There is some pretty neat history in the area. Thanks for posting about this!